If you’re a fan of a commanding driving position, you’re in luck. Even with the driver’s seat set to its lowest position, all three will have you staring over the roofs of most other cars. If you’re short, it’s easy to jack yourself up enough to see the end of the bonnet, thanks to standard electric front seats. They also have four-way adjustable lumbar support and extendable thigh support. We didn’t have any issues getting comfortable in any of them, although the RX’s seats are a little fl at, allowing you to slide around more in corners. For those chilly mornings, all get heated front seats, although the RX adds heating for the outer seats on its second row, along with a heated steering wheel. Those last two items cost a reasonable £250 on the Touareg but £650 on the Q7. The Touareg is alone in offering massaging front seats (£1050). All get front and rear parking sensors as standard, but there are definite winners and losers in the visibility stakes. While the RX is the only one to get a bird’s eye-view camera system complete with a reversing camera and blindspot monitors as standard, it also has the thickest windscreen pillars, smallest side windows and chunkiest rear pillars. Seeing out of the Q7 is easier, but it doesn’t get any cameras at all as standard. Meanwhile, the Touareg’s pillars are no more intrusive than the Q7’s, while a reversing camera and a self-parking feature are standard. When fitted with four-wheel steering, it’s the easiest to manoeuvre in tight spaces. But the biggest differences between these three come when you take a closer look at the fit and finish of the interior. While the Touareg certainly looks fl ash with its 15.0in infotainment touchscreen butted up to a 12.0in digital instrument cluster, glitzy trims and white stitching, closer inspection reveals materials that would be more at home in a £25,000 Tiguan, not nearly £60,000 worth of luxury SUV. Sure, there’s plenty of squidgy plastic on the top of the dashboard and doors, but everything below this is hard to the touch and there were some inconsistent gaps between the chrome trim around the touchscreen in our test car. Although the RX isn’t free of hard plastics, there are far fewer of them. Some of the upholstery on the doors feels thin, too, but overall the interior is sufficiently plush. But the undisputed winner for quality is the Q7. Not only does every switch work with delightful precision (a few of the RX’s could have been lifted from a cheap hatchback), but there’s also loads of squidgy plastic. All in all, it feels like the most expensive car here. The Q7 is also the simplest to use, with all the controls in logical positions. In comparison, the RX places a few buttons (such as those for the heated seats and steering wheel) where they’re hard to see. Still, it’s better than the Touareg, which has an interior that has been largely stripped of phyical buttons. While that might sound like a minimalist delight, it means you have to delve into the touchscreen just to tweak the climate control and even make certain adjustments to the seats. That’s acceptable when you’re stationary, but it’s very distracting when you’re on the move. Audi’s MMI system remains one of our favourites. The display is big enough, with crisp graphics and easy-to-navigate menus, while Apple CarPlay and Android Auto smartphone mirroring are standard. It’s also a doddle to use on the move, thanks to the rotary controller that’s located between the front seats. Making things even easier is a touch-sensitive pad that can recognise handwriting, plus physical shortcut buttons for hopping straight to your required screen. The RX gets off to a good start with a large screen that dwarfs the Q7’s and is mounted at a convenient height. But instead of a rotary dial controller or a touchscreen, the RX has a bizarre joystick that is infuriatingly fiddly to use, even when you’re stationary. To make matters worse, the graphics are looking a bit dated and there’s no support for either Android or Apple smartphone mirroring. At least you get a thumping Mark Levinson stereo as standard with Premier trim. The Touareg’s monster 15.0in touchscreen dwarfs the other systems here. But while its graphics are sharp and it proves responsive to commands, some of the menus are needlessly confusing and many icons are too small to hit on the move. At least the home screen is configurable, so your favourites are easily accessed. While you’ll appreciate it being heavily angled towards you if you’re driving, it’s trickier for the passenger to operate. If you’re taller than average, the Q7 will be your best bet, because the front seats go back the farthest and it ties with the Touareg for front head room. In Premier trim, the RX has a standard sunroof that eats into front head room; there’s a whopping 70mm less than in the other two. While most people will be fine, those with particularly long bodies might want to consider a lesser trim. Passengers in the second row all have plenty of head room and sliding and reclining seats, so you can prioritise boot space or leg room accordingly. But while all are closely matched for leg room on paper, there are big differences when you actually sit in them. The Touareg and Q7 both have deep rear footwells and plenty of room under the front seats for feet, whereas the RX has a higher floor and less foot room, forcing taller passengers’ knees up towards the roof. At least the RX’s floor is fairly fl at, so the central passenger isn’t straddling a big hump. With the Touareg not being available with seven seats, that leaves the Q7 and RX to duke it out for third-row honours. But it’s no contest; the Q7 has significantly more head and leg room right at the back, plus a deeper footwell once again. Put simply, the Q7 could take seven average-sized adults on a long trip in reasonable comfort, whereas the RX’s third row is really only suitable for emergencies. And all six of the Q7’s passenger seats are equipped with Isofix child seat mounts, whereas only the outer second-row seats get them in the other two. The Q7 triumphs when it comes to boot space, too. Like the Touareg, it can swallow 10 carry-on cases in five-seat mode, but there’s more room left over. Meanwhile, the RX’s boot is shallower, managing one less case than the others, and there’s less luggage space than in the Q7 in seven-seat mode. When folded, its second and third-row seats create a slope up to the front seatbacks, too. Boot is even longer and wider than the Touareg’s; with the third row folded away, it’s the most practical here. Airsprung cars can ‘kneel’ for easier loading. Hybrid powertrain’s large battery pack means the ¬floor is higher than in the others. In five-seat mode, its boot is somewhat smaller, accommodating one less suitcase. With no third row to worry about, the Touareg beats the bigger Q7 for boot space on paper but not in practice. There is a small lip, but it’s unlikely to cause any issues. The Q7 is the cheapest to buy outright, followed by the Touareg and the RX, with around £4000 separating them. The RX accounts for much of this difference by having comfortably the most standard equipment, though. 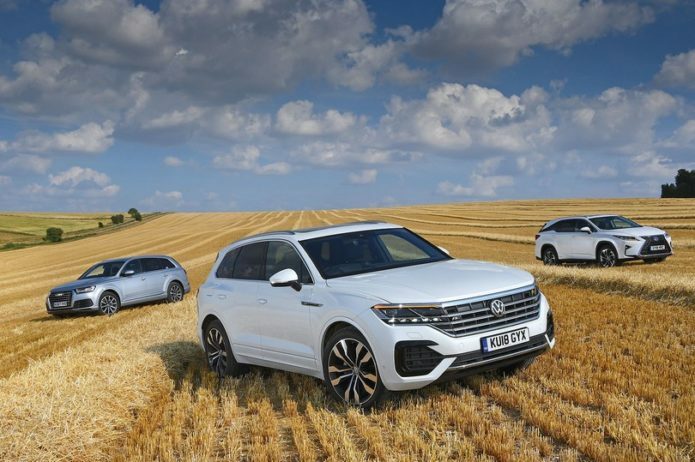 Although official average fuel economy figures suggest the Touareg gets around 5mpg less than the Q7 and RX, we found there to be just over 1mpg difference between the three. The Q7 was most economical and the RX the least, but that’s only around £70 difference over three years and 36,000 miles. The RX is most frugal in urban situations, while the other two are more efficient on long motorway drives. Factor in other running costs such as servicing, depreciation and insurance and the Q7 is the cheapest option for a private cash buyer by a significant margin, largely because it sheds value at a slower rate. Mind you, it’s the Touareg that’s cheapest per month if you’re buying on PCP finance, thanks to a hefty deposit contribution from Volkswagen. The RX is the priciest, setting you back another £100 a month. If you’re a company car driver, you’ll pay the least in benefit-in-kind tax (by about £2500 a year for those in the 40% tax bracket) if you opt for the RX. That’s partly because it emits a lot less CO2 and partly because it runs on tax-friendlier petrol. Meanwhile, the Q7 is the cheapest to lease and Touareg the priciest, although only £11 a month separates them. As for safety, both the Q7 and RX gained a five-star Euro NCAP crash test rating. The Q7 was marginally better at protecting those in the front and a fair bit better for rear seat passengers, while the RX scored higher for driver aids, having more as standard. The Touareg hasn’t yet been tested. The RX’s driver aids include automatic emergency braking (AEB), lane-keeping assistance and a rear cross-traffic alert. The Touareg gets AEB and lane departure warning, but you’d need to spend £860 to bring it up to a similar spec to the RX. The Q7 gets the least active safety kit as standard, although you do get AEB. We’d recommend considering the Tour Pack Advanced (£2655) for the Q7, because you get lane-keeping assistance, AEB that works over the car’s entire speed range, adaptive cruise control and air suspension, which is £2000 on its own. It may be three years old, but the Audi Q7 is still the best luxury SUV you can buy. Not only is it one of the most relaxing cars on the planet to bumble around in, but it can also pick up its skirts and charge up to motorway speeds, even with a full load on board. Given that it’s the most spacious and has the joint highest towing capacity, with optional air suspension fitted, there really isn’t much it can’t do. In second place is the Volkswagen Touareg. Although it doesn’t have seven seats, it’s thoroughly practical, roomy and, in the right spec, almost as good to drive as the Q7. However, it’s let down by its cheap-feeling interior and an uncomfortable ride unless you pay extra for air suspension. Bringing up the rear is the Lexus RX L. While it’s well equipped and makes a great deal of sense for company car users, it lags behind when it comes to the driving experience and has a downright frustrating infotainment system.